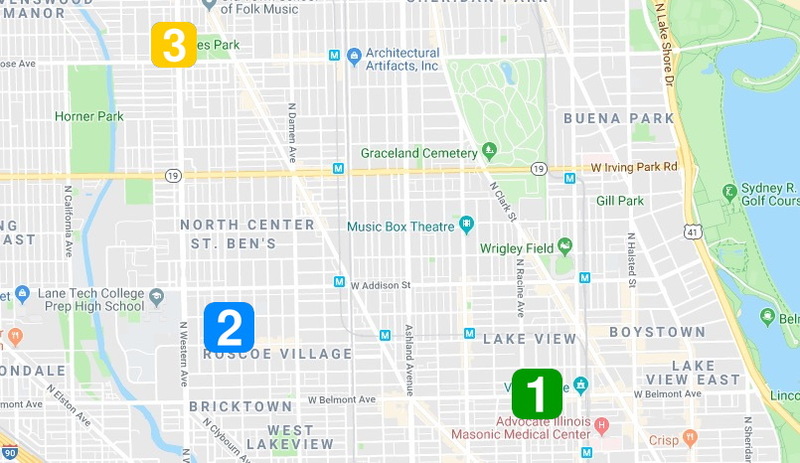 • A Lakeview man was robbed at gunpoint by three offenders in the 1100 block of West Barry around 12:15 a.m. The robbers were three black men, each about 20-years-old. According to a witness, the gunman wore a gray hoodie and jeans with a red, white, and blue hat. Another offender wore a darker gray hoodie. The third suspect wore a gray hoodie with a black vest. They were all last seen running south on Clifton. A nearby resident’s surveillance camera caught images of the offenders running from the scene. The clip below is not of very high quality, but it may help other residents with home surveillance systems identify footage of the suspects for police. • Then, around 1:40 a.m., a Roscoe Village man was robbed at gunpoint outside his home in the 3300 block of North Bell. The victim said a male offender of unknown race approached him, pulled out a gun, and took his phone and wallet before running from the scene. • Most recently, the Shell service station at 4346 North Western Avenue in North Center was robbed at gunpoint around 3:45 p.m. The cashier told police that a robber came into the store and took the register cash while holding her at gunpoint. He then got into a car and fled northbound on Western. Police said the robber is a black male in his 30’s who stands about 5’8” tall and weighs about 160 pounds. He was wearing a brown hood and a black mask.